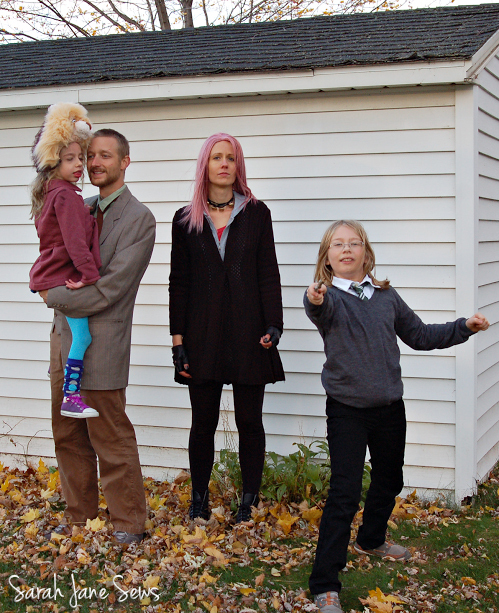 I'm sure this will come as a major shock, but we chose Harry Potter as our family costume theme again this year (2011's costumes and last year's). At this point, we're starting to dip into the secondary and probably tertiary characters, so whenever an average person (read: non-obsessed) asked who we were going to be, there was generally a lot of explanation on my part, followed by them smiling and nodding and most likely still having no idea what I was talking about. 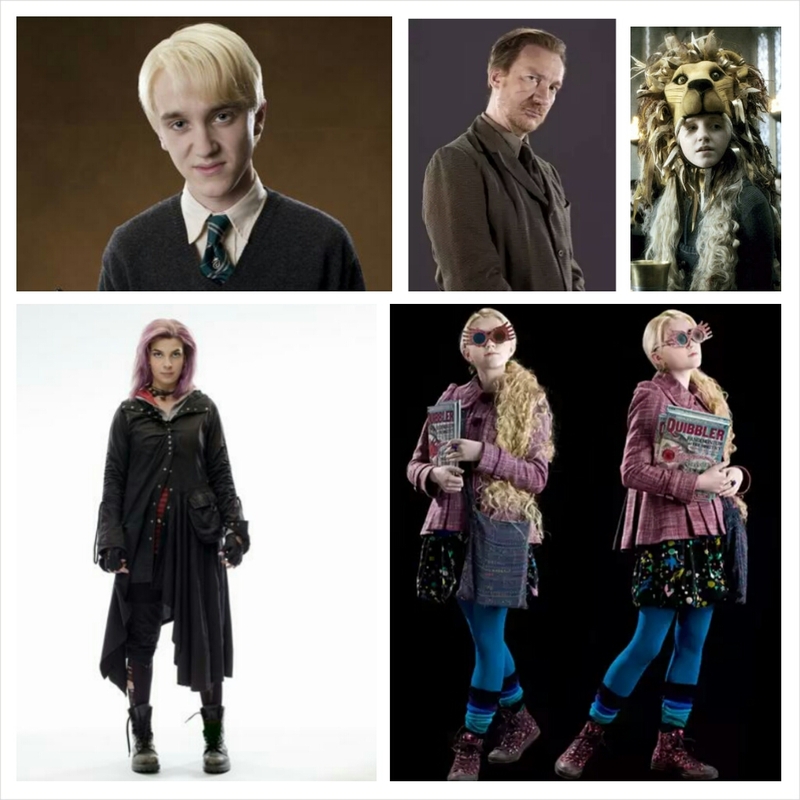 Ray was Professor Lupin, I was Tonks, E was Luna Lovegood, and O was a "generic Slytherin student." 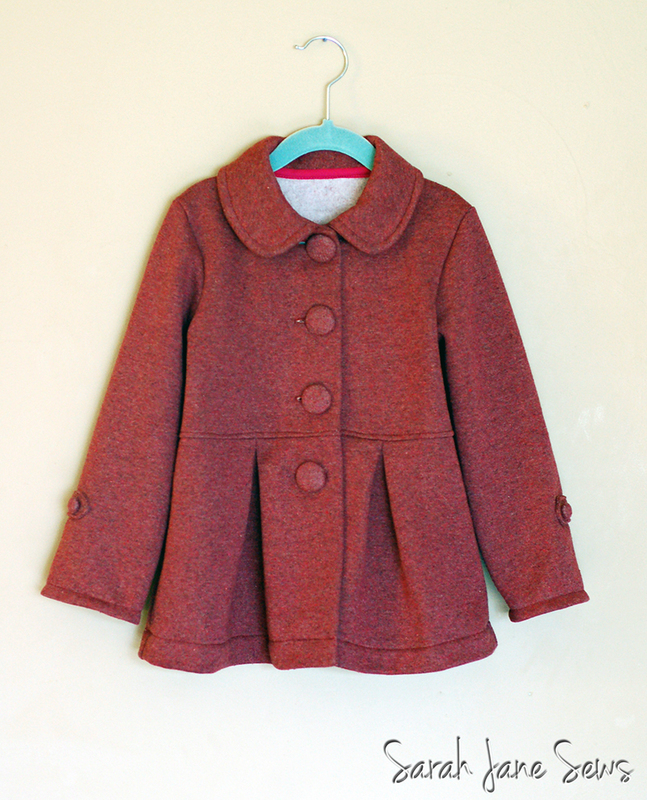 Last week was Kid's Clothes Week, and while I didn't officially sew along and keep up on the blogging this time (I have such a major backlog from summer still to post about! 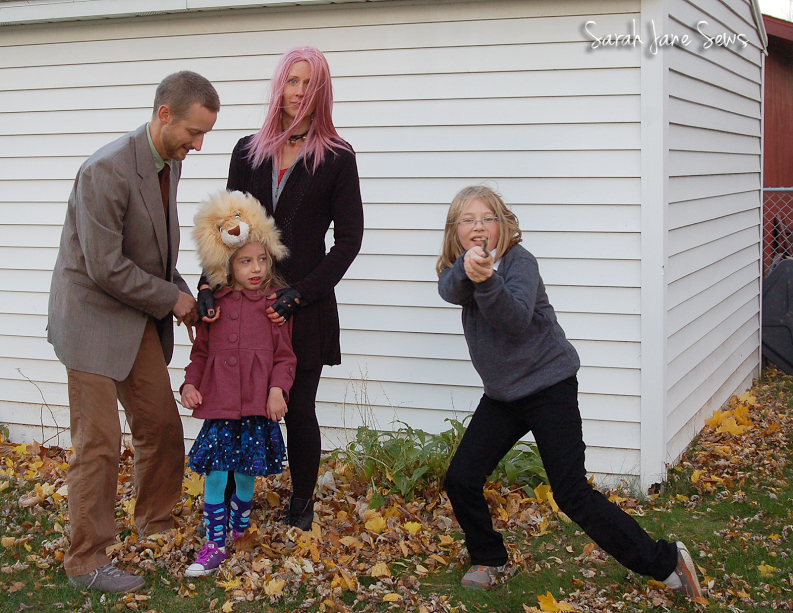 ), I did make a couple of the kids' costume elements. As much as I love crazy costumes, I was happy that this time their things are all re-wearable on a daily basis. 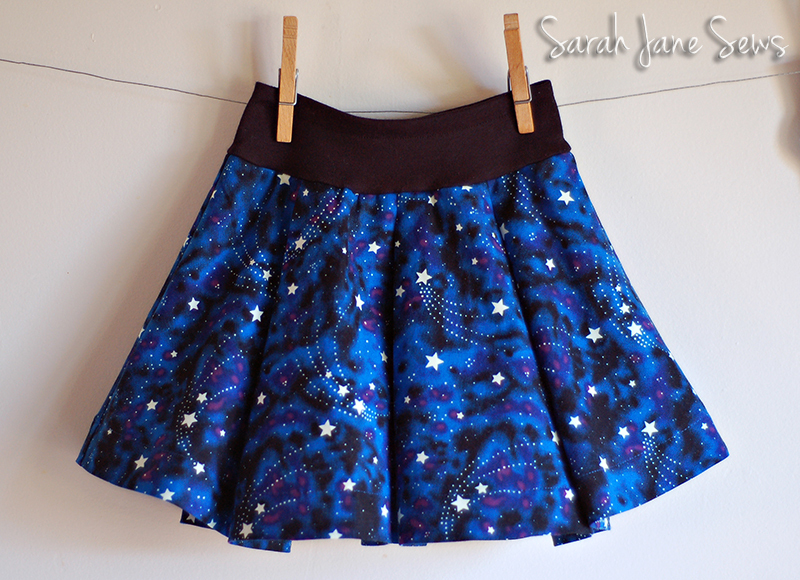 I started with Luna's skirt, the Montmartre from Ottobre Design 4/2010. It's a pleated woven skirt with a knit fold-over waistband and an elastic casing. I made the size 98 width/104 length and cut the waistband only half as high to eliminate the fold. 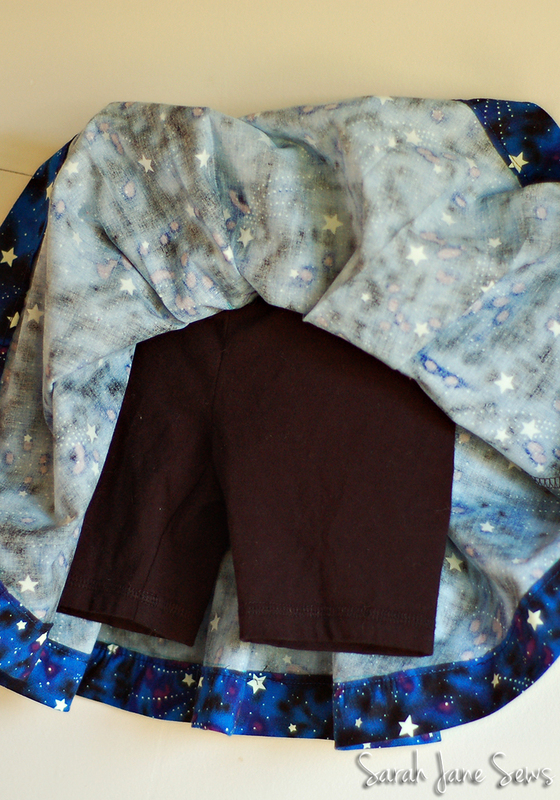 I also cut the waistband off of some RTW knit shorts and serged them on at the same time as the skirt's waistband. I love how it turned out. 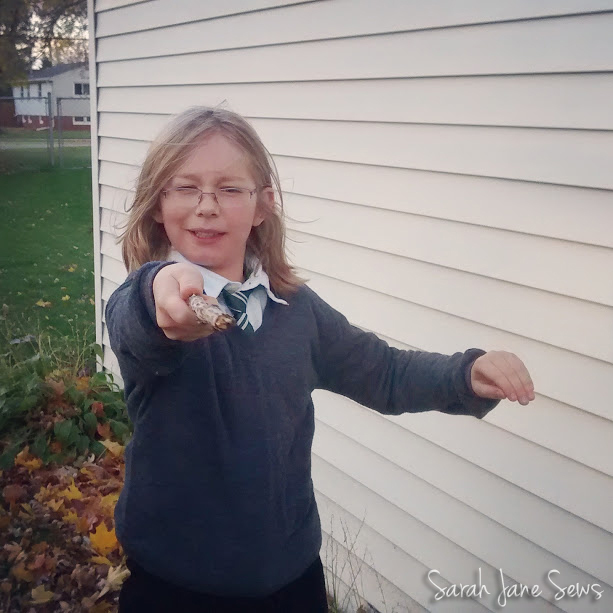 Next up was a Hogwarts sweater for O to go with his button-down, black jeans, and Slytherin tie from Ebay. 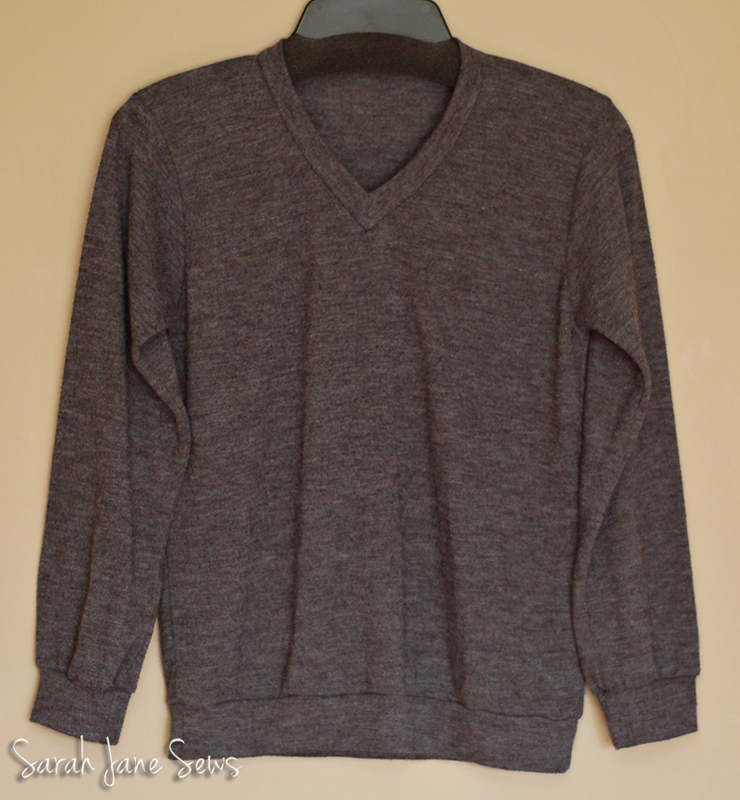 I had some charcoal grey sweater knit in my stash and sewed it up using my old standby, the Fishsticks Designs Charlie Tee. 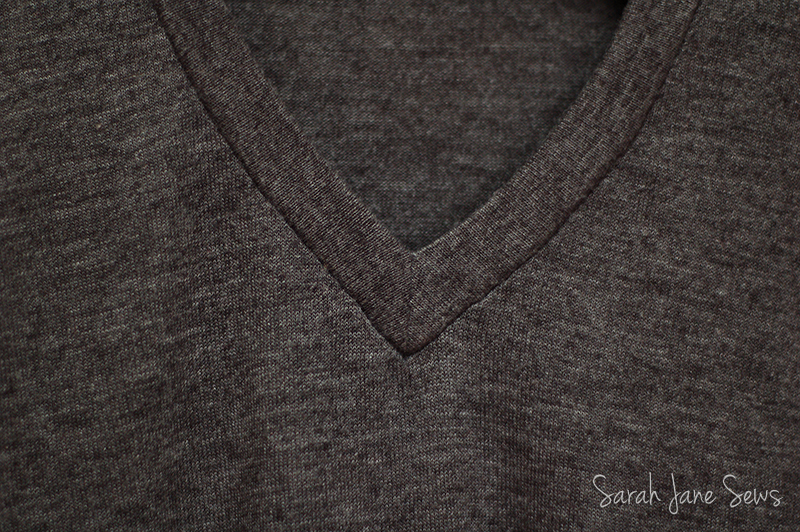 I sized up, as recommended for the hoodie version, and winged a v-neck based loosely on the Mamu Design Sabrina pattern. I was a little nervous about both the fabric and the v-neck, since I'd never used either before, but it went together really seamlessly (heh). I serged everything except the neckline and had zero problems. So much faster than knitting a sweater! His shirt is untucked underneath, so it looks kind of bunchy, but the fit is great. I think he'll get a lot of wear out of this. 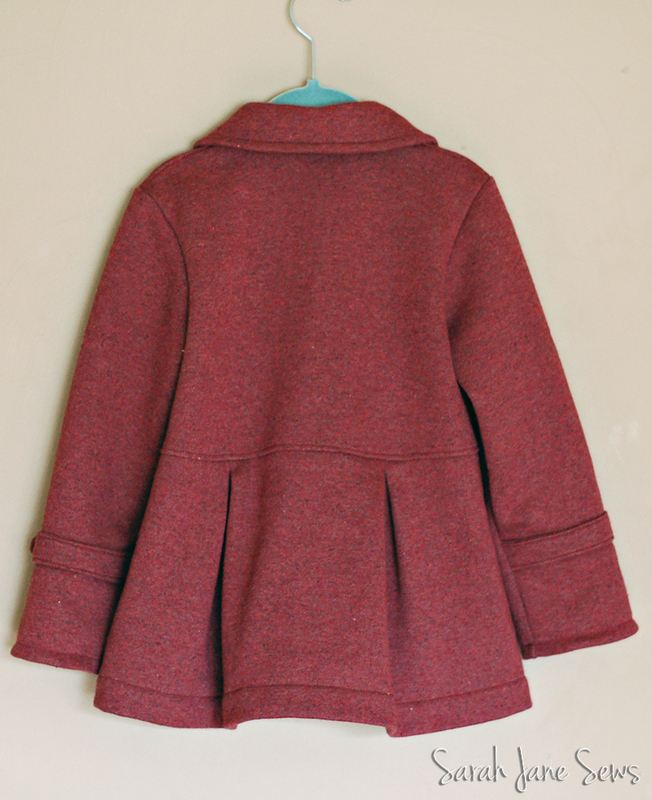 Then this week I made E's Luna jacket from the Ottobre 1/2010 Variksenmarja coat pattern, size 104. 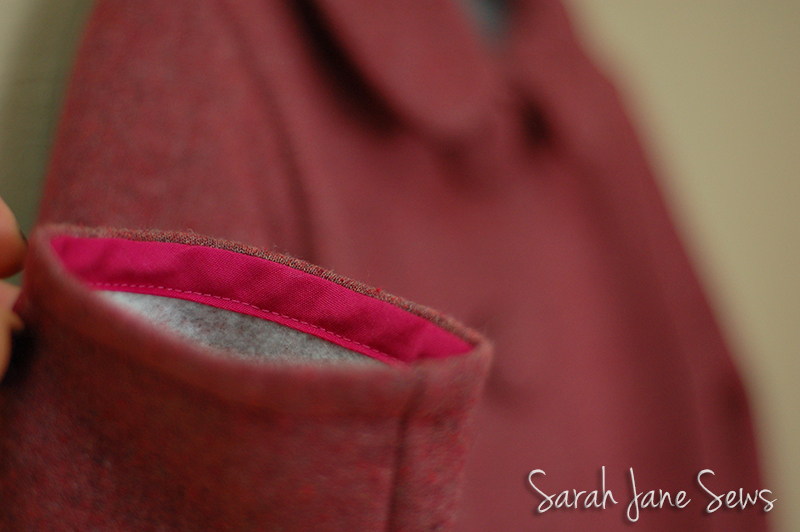 It's meant to be corduroy with a lining, but I made it unlined out of sweatshirt knit that I ordered online. IRL it's more of a burgundy than the pink I thought it was going to be and as it appears in most of these photos. I was a little bummed about that, but it turned out so cute that I'm over it. 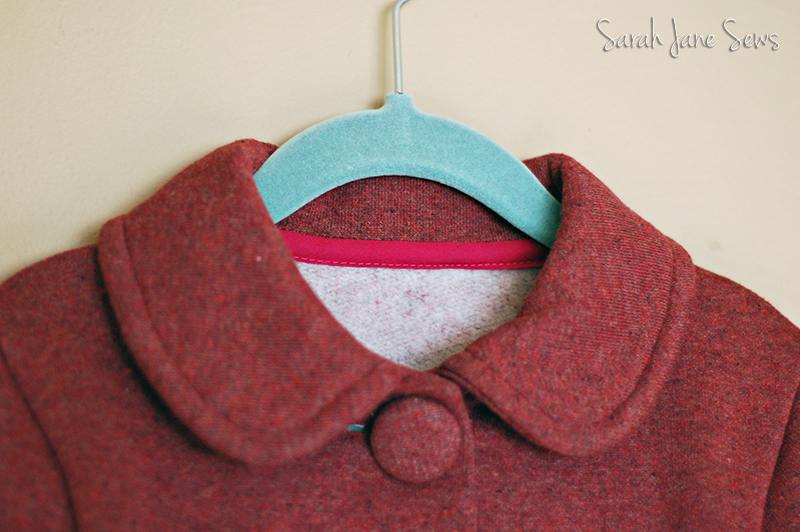 I rounded the collar and cut about 4" from the length. The sleeves were also just about perfect for her before I hemmed them, so to eek out as much length as possible, I used single-fold bias tape for the hems. The neckline is finished with the same thrifted vintage bias tape. This technique always makes me inordinately happy. This might be my favorite project all year. 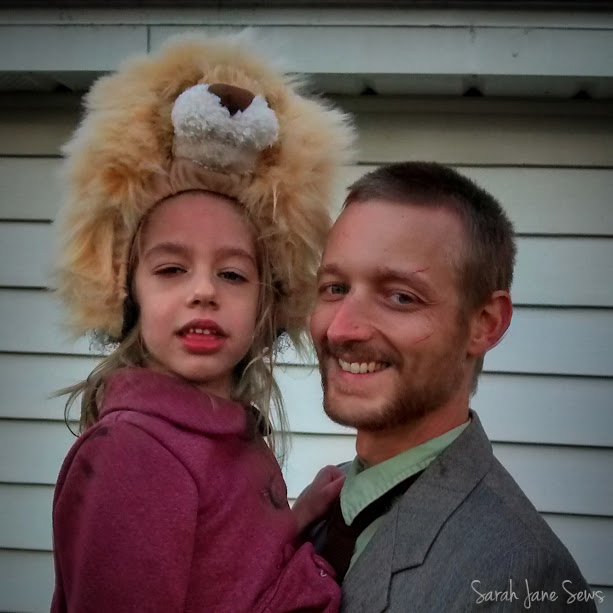 The lion hat was from a thrifted costume that I cut the hood from and finished with bias tape. We added tights and legwarmers over her AFOs and her usual footwear, Chuck Taylors, which Luna also wears. It was super windy last night when we were taking pictures. E was not a fan of that part. Lupin's suit and tie were from the Goodwill Outlet (textiles by the pound!!). There were matching pants too, but they were several sizes too big and I ran out of time to alter them, so Ray just wore some brown pants and a dress shirt he already had, and we added some facial scars with makeup. 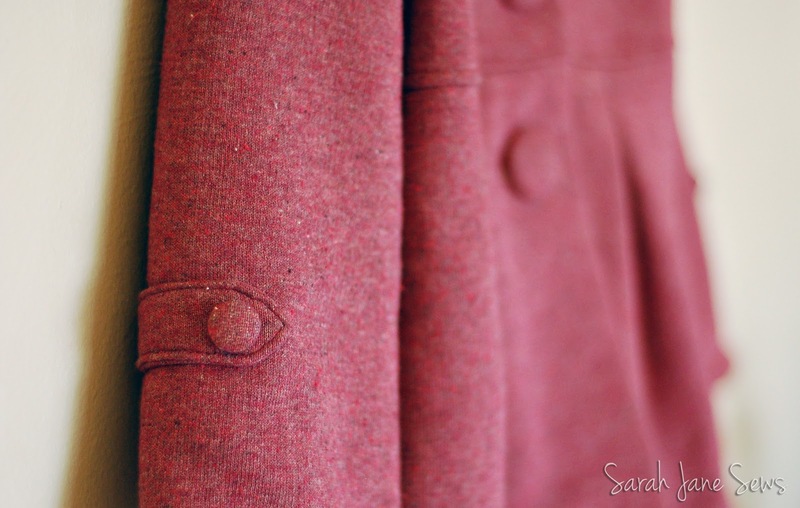 I had planned to sew a more Tonksish coat for myself, but of course ran out of time. On the plus side, our costumes were actually ready before we needed them, and I was never sewing into the middle of the night. My sweater, hoodie, t-shirt, and leggings were a combo of things I already owned and bought knowing I would wear them otherwise. 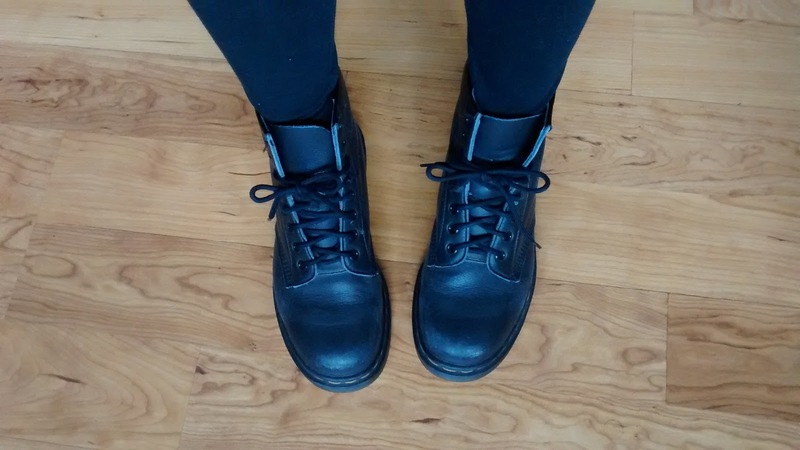 I also got to dig out my vegan Doc Martens that were a College Sarah wardrobe staple. I remembered them being a lot more comfortable. Those suckers are heavy! 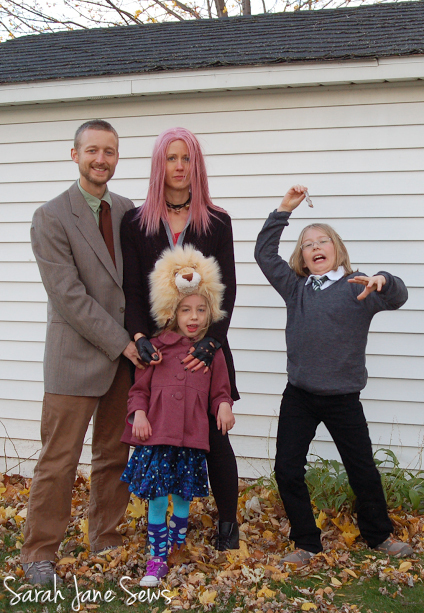 The driving gloves and wig were Ebay purchases. 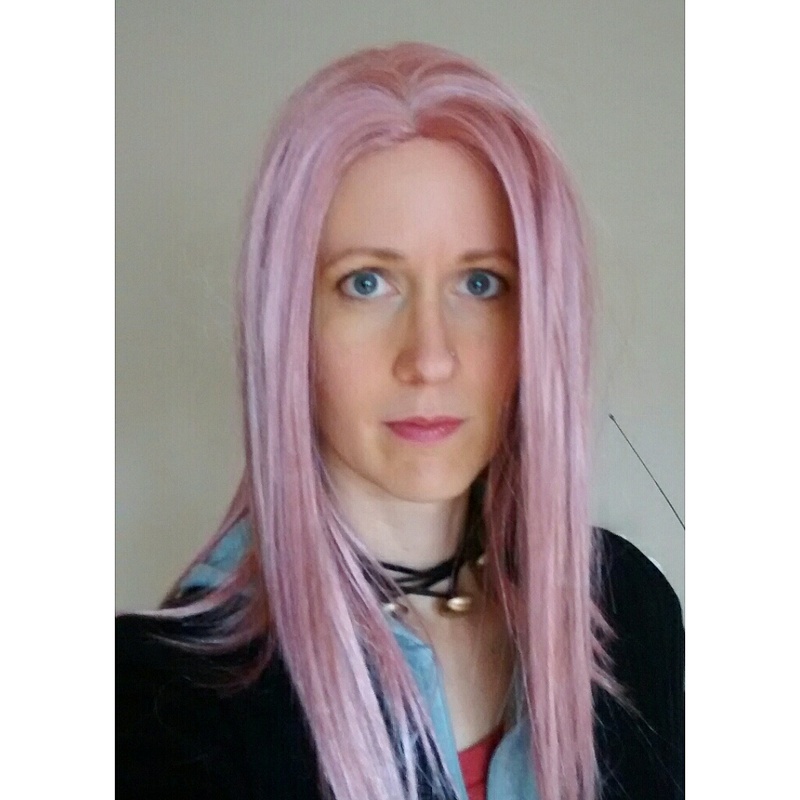 I wasn't expecting to like the pink hair at all, since I don't do much pink, and pretty much never pastel. But I really like it! Too bad I'm both too cheap and too lazy to do it for real and keep it up. 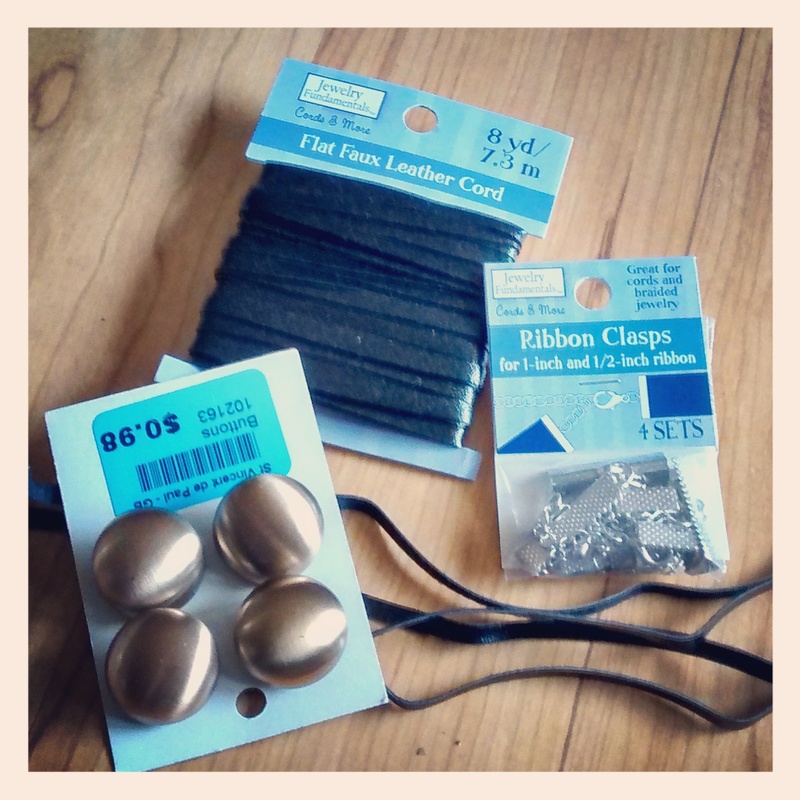 I made the necklace from faux leather and ribbon clasps from Joann's and buttons from St. Vincent de Paul. I don't know about you, but our St. Vinnie's has a fantastic button selection, and they're so much cheaper than buying them new. I always try to check there first on the rare occasions that I plan ahead. E was giving O some serious side-eye by the time we finished with photos. It cracked me up when I saw this one. I think she was confused by his spell-casting. He was very, very into it.